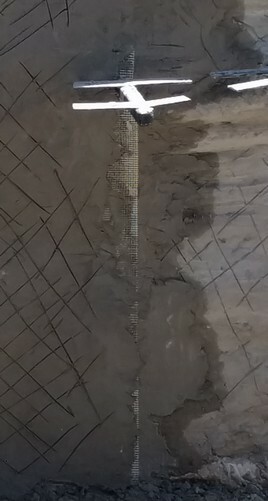 The last installment covered rendering the earthbag wall and creating the suspended concrete slab. 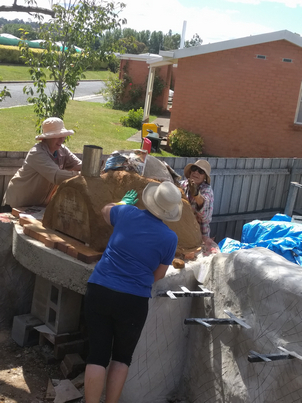 Now the fun begins, the construction of the pizza oven out of very simple easy to source materials; clay, sand, straw, and water. Together these become cob. There are 10 steps to building the pizza oven. Building the entrance arch and doorway. It might sound like a funny place to start but it works. My research on the net led me to a series of blog entries “The Year of Mud: Natural Building Workshops” by Ziggy. They clearly explain the sequence of building an entrance, making cob, right through to the finished oven. Thank you Ziggy for such a clear step by step blog. Here are the links to those blogs. 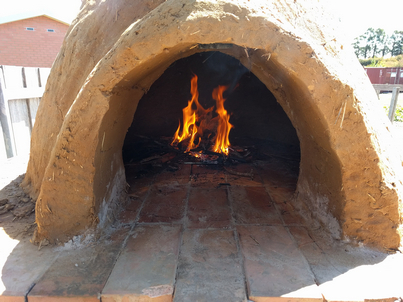 Below is a photo gallery of our pizza oven build. 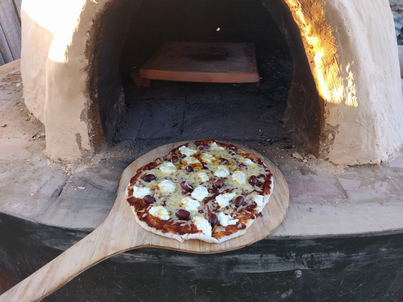 Although Ziggy’s blog gives all the information you need to create a great pizza oven I will add a few things here. 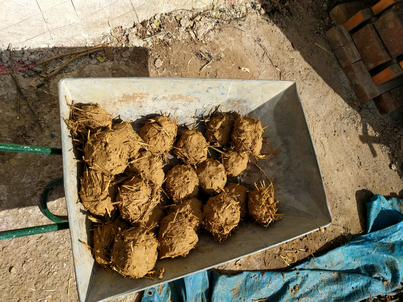 I soaked the clay which I sourced from a nearby pile that had been dug out for installation of an underground water tank. It was put into a plastic dustbin and water added and left for a few hours or preferably a day. Sand Mould. 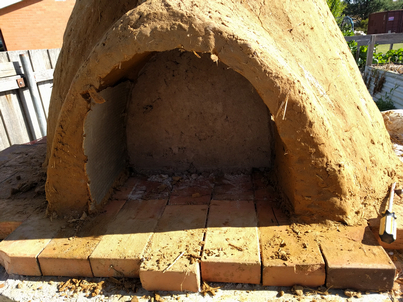 I used builders sand to create the mould over which the pizza oven was constructed. Cut a stick to the right height of the oven and place it where you want the highest point to be. I placed concrete blocks underneath the concrete slab to help take the weight as the sand adds quite alot of extra weight. We had a lot of fun treading the cob together and applying to the sand mould. Don’t forget to put a layer or two of wet newspaper on the sand before adding the cob. This will aid in removing the sand later on. Insulation layer. After completing the first layer we left it until the next morning to firm up. Then we added the insulating layer. 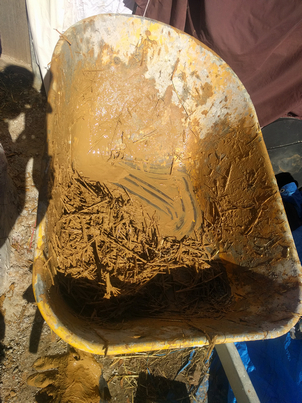 This is made from mainly straw with a clay slip (clay mixed with water until runny) added and mixed in the wheelbarrow. The insulation coat adds a layer with lots of air pockets that keeps the heat that has been sucked into the thermal mass layer in the oven. 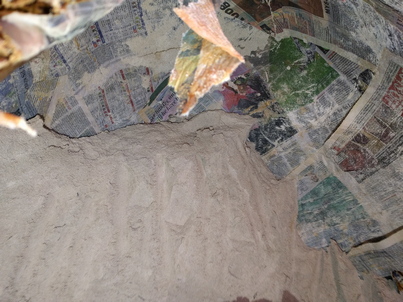 Final layer of Cob (Earth plaster) To protect the insulation layer we added a layer of earth plaster. 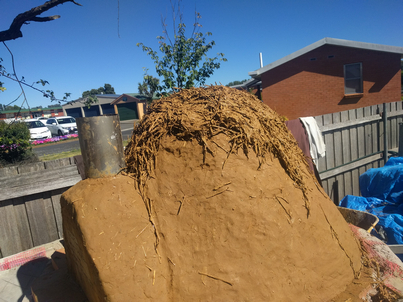 This is basically clay and sand at the same ratio as the cob with chopped straw added. We used a lawn mower with a catcher to cut up the straw. this gives strength to the plaster but also makes it possible to make it smooth. Removing the sand. After a few days to start drying it was the moment of truth. Would the pizza oven stay together after removing the sand. I used a short handled shovel and a trowel to remove the sand. 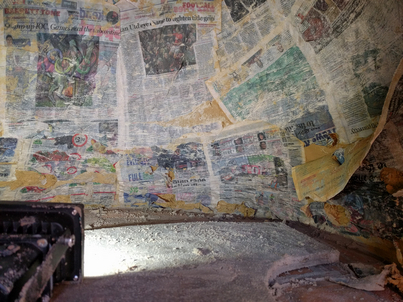 It was very easy to see when I had got to the newspaper layer and saved damaging the cob. Firing the oven. To help it dry put and to see if the oven draws properly a SMALL fire was lit. This was done several times to ensure that the cob dried out slowly. Cook and eat pizza, Now we were itching to see if the rocket fired pizza oven would work. 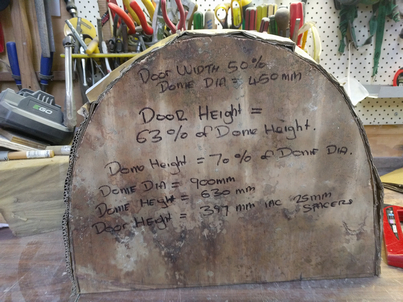 A door was made from recycled floorboard backed with some cement sheet and a thermometer inserted. The rocket stove was fired up and the oven started to heat up. 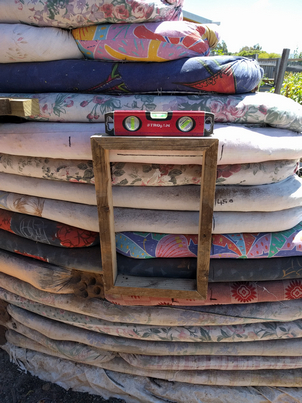 It took a while and it was noted that the steel plate that the pizzas were cooked on needed to be lifted up more to give a greater draw to the rocket stove. Also the door started to char and when it was removed a light winds turned the embers into flame!! Not such a good start. However a pizza did eventuate. 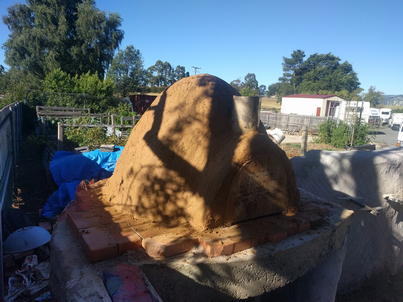 The next one would be cooked with a better door and with more of a gap between the floor and the cooking surface to enable the rocket stove component to work more efficiently. See part five for final rendering, finishing of shelves and the new door! 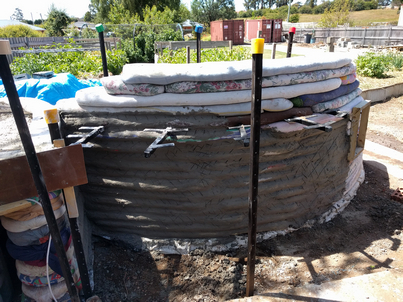 Once the wall was finally built, the suspended concrete slab poured and the rocket stove built it was time to build a truth window and render the earthbag wall. I will update this post as I put successive layers of render on. A truth window is often built into straw bale houses so that people can see how the walls were built. 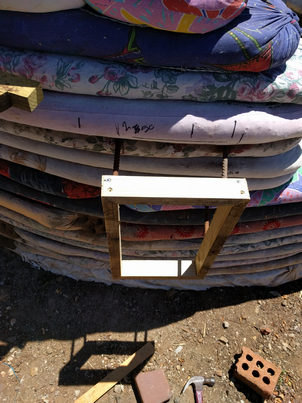 I decided to build one into the earthbag wall. I built a wooden frame and inserted lengths of reo bar in the back of it which were driven into the earthbags. After construction I taped up the front surfaces to protect them from any render that I might get on it. The window will have a hinged front with polycarbonate so you will be able to see how it was constructed. I soaked the lime for about two weeks in an old plastic dustbin. this ensures that the lime fully hydrates. Is is so fine that it takes time to take up the water. Wearing mask, goggles and gloves to protect me as lime is very alkaline and can burn I half filled the dustbin with water and then added the 20kg of lime. Using a drill attached paint stirrer I mixed thoroughly and then added more water as needed. Checked it every few days and stirred it well before use. Always leave an inch of water on the top to keep it well hydrated. The first coat really started to fill in the gaps between the earthbags. I made sure that I cross hatched the surface so that the next coat would have a good key to stick to. To ensure that cracking did not happen I added a layer of fibreglass mesh between layer one and layer two. The mesh was about 200mm wide and I found this was a good width to render onto. Any big gaps between the earthbags were filled in before the mesh was put on. 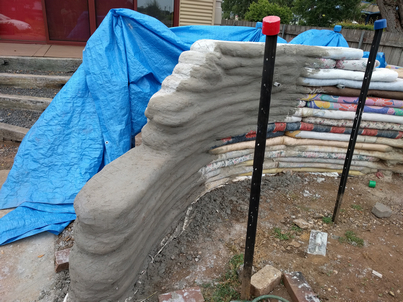 I kept the walls damp to slow the drying time as it was reasonably hot (even for Tassie). Note the edge of the render mesh in picture below.